It’s been a hard week for blogging…you must have all noticed that we missed doing a mid-week post :). Lisa has been busy hosting an international visiting scholar, and Dan has been in Bathurst for work. But we did manage to do some notable (at least to us) things separately, both involving our bicycles. Dan was thrilled when the CSU-assigned car (all uni travel is done using car pool vehicles) was big enough that he could get his bike in the back. He was going for the whole week, and wanted to be able to do some riding. And not just any riding: his hotel is on Mount Panorama, facing Conrod Straight on the famous Mount Panorama Circuit. So he thought it would be cool to ride around a race track. As has been pointed out here before, Dan is a bit of an idiot…he didn’t really do his homework when it came to this. If he had just looked at the Wikipedia page (linked above) he would have known that there was a huge hill on the 4-mile track. Or, well, just think about it for a minute…the next day, he said to one of his work colleagues that he didn’t realize there was a hill. She gave him a quizzical look and said “It is called MOUNT Panorama.” But he just thought the track went around the hill; race tracks are supposed to be (mostly) flat. Anyway, he managed to do it on his first day there, along with some other hilly terrain nearby. The next day, he opted just for some (still hilly but not as bad) town riding. On Wednesday, he decided to tackle the mountain again. But, this was his 5th day in a row of hard riding and his legs were getting tired. 2/3 of the way up, he decided it wasn’t fun anymore, and turned around. Only to end up doing some long hills on other roads anyway… Bathurst is a hilly city. The best thing about the track, however, is that race tracks need to be pot-hole free, so this is the best pavement he has ridden on. Though the climb was hard, coming down a perfectly-smooth hill at 50 km/h is pretty exhilarating. He would have gone faster but Bathurst is also a very windy city, and the a 30 km/h sustained wind, gusting to about 40, was holding him back. Except on some of the curves where it became a crosswind…freewheeling down a curvy hill at 50 k, wobbling in a 40 k gust, is pretty scary! Lisa’s cycling adventure is more of a milestone however. It was her first time out alone! She had one free evening, so after work slathered on some sun block, helmetted up, and headed out to Lake Albert. She is now familiar enough with that area to not get lost. And according to her Cyclemeter iPhone app, did the fastest riding she’s done yet (Dan edit: why won’t you go that fast with me?). 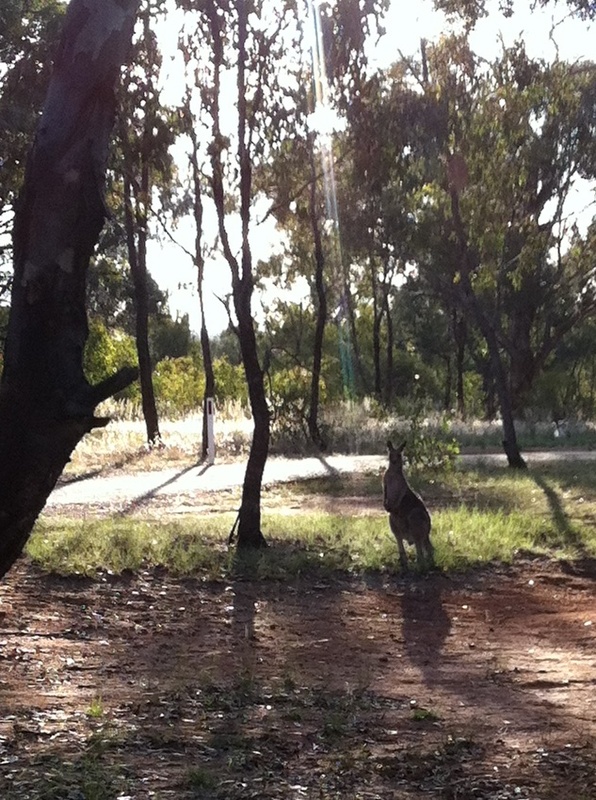 And, for the first time while riding, encountered some kangaroos beside the golf course (Dan edit: I saw some too at the Bathurst reservoir…on top of another bloody hill). This is a pretty cool place to ride right now: roos, darters, herons, egrets, moorhens, swamphens, cockatoos, gallahs, parrots… When she got home, Lisa texted Dan to say she had gone for a long ride; she said she was going to do it some time during the week, but he didn’t believe her. When he got home on Friday and saw her helmet and water bottle still out on the bench, he wondered if she had done it. “Yes,” she said, “and I sent you a text and a photo of some roos, but you didn’t respond.” Well, it turns out that when she looked at her phone, it didn’t send for some reason. Oh well, Dan will now believe her that she can and will ride alone. On returning home, however, Dan also had a milestone. Lisa had been talking to another visiting scholar about cycling, and he was lamenting that there were no bikes for rent in Wagga. After a long flight from the UK and a week of working, he was itching to get active. Lisa offered that she would ask Dan if this person could borrow his bike. He had to think about it…it is his baby! But he agreed, though thought it would be preferable if the visitor was short and would prefer her bike instead (partly so he could ride with him). But that wasn’t the case, and we arranged to get the person to our house, and Dan entrusted him with it (at least this person recognized it for what it was…he is an avid cyclist). Dan found it easier giving the person access to our garage and house (because we were going to be out when he returned it) than his beloved bike. And we even drew a map of the interesting roads and trails nearby, complete with details of hazards and birds! In the end, the baby came home without a scratch. All is well… So all potential visitors out there, you may just be able to convince Dan to let you take his bike for a spin when you’re here with us. 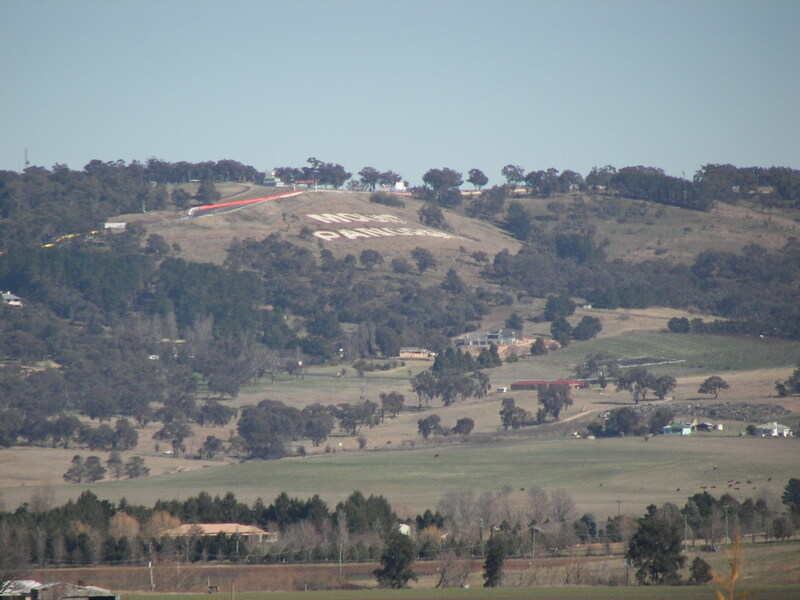 This entry was posted in Bathurst, bicycles, cycling, kangaroo, lake albert, mountains, wildlife. Bookmark the permalink.